We’ve reached out to Mt.Gox as the ongoing prices variances continue this week requesting comment on the price differences of Bitcoin listed at the Mt.Gox website. As Mt. Gox has initially acknowledged our inquiry based on a retweet invitation from Mt.Gox earlier today, we’ve sent Mt. Gox the following questions detailed in this article and look forward to a response that offer’s clarity to this Bitcoin price difference issue. At BTC World News, we’ll share any updates received and will continue to report on this ongoing story. It’s Sunday, July 28, 2013, at nearly high noon and while taking a look at our Bitcoin browser addon in Chrome, we noted the price of $91.80 which is streamed and reported by Mt.Gox. During this same moment we’re busy at work improving the information available on our BTC World News website and noticed the price was listed at $99.00 which also streams from Mt.Gox also within a 2 minute window.Taking note of this price difference and what might be going on, we looked at Bitstamp to compare prices and noticed a significant price difference of $88.61. We then went to Coinbase and checked their buy price at $91.86. To date, we’ve been under the impression that Mt.Gox leads the way on establishing and or posting the most accurate Bitcoin prices, though looking at Bitstamp, we have to question what a much better purchasing price is available at Bitstamp. As for Coinbase, they appear to be riding slightly over Bitstamp in price which has been reasonably accurate to date. The question is, who or what sets the price on Bitcoin as this price difference seems that it could be the difference between making a profitable trade or a trade that results in a significant loss. We ventured over to Blockchain to take a look what has been exchanged in the last few minutes and discovered that 50o+ transactions had taken place and 33051 during an entire day. Taking into consideration that Mt.Gox at this moment was listed at $99.00, that would equate to $50,292.00 of total transactions exchanged in this short window. That’s at most a $5,278.12 difference and we have to ask, what is going on with this significant exchange difference? We also want to keep in mind that these number’s presented are an estimate. To determine exactly which Exchange processed how many transactions in total, would require a “snapshot in time” of each Exchange to be able to state for absolute certainty what the total transaction amounts are. Though the number’s represented here are enough to look closer into what may be occurring. Additionally, BTC World News wishes to clarify that the numbers represented here are not intended to state that the each of the said company’s solely executed this number of transactions. These are generalizations to provide comprehension of how a flow of transactions could impact Bitcoin’s total value. 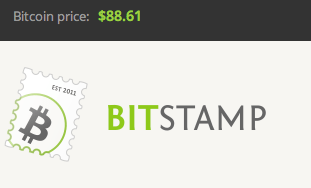 First, purchase Bitcoin from Bitstamp at the lower rate, then transfer the Bitcoins to Mt. Gox, and sell. Withdraw your immediate profits and repeat. Technically it seems that an individual could yield hundreds, if not thousands in profits almost instantly with this simple formula. The only wait period is having the funds wired and deposited, therefore if you performed a rotation through a 10 day cycle an individual would be extremely profitable. On the other hand and the question to ask is, is this a serious problem building? At BTC World News, after posting this article, which documents these questions at hand, we will reach out to these entities and request comment why there’s price differences and what measures are being performed to ensure accuracy in public trading. What entity actually sets and defines the current value of Bitcoin? If none, what formula is being used to generate a value of Bitcoin and does this formula conform to a world wide standard that all Exchanges adhere to? What measures are in place to ensure that Bitcoin’s price is reasonably accurate across Exchanges? The bottom line is, Bitcoin is world wide currency and if prices are going to adjust according to a demographic, region or similar, then we’re in the same boat we are with current day currency. It’s imperative that Bitcoin maintains consistency across the planet and if that is not the case, then is it’s the responsibility of the Exchanges to make the public aware of their own price structures so the consumer can make an informed choice when it comes to Bitcoin. BTC World News will follow up with this story and report the responses or no responses provided by each Exchange. We hope you’ve enjoyed this article on Serious price differences between Bitcoin Exchanges and hope you would consider donating some BTC to us here at BTC World News. Simply click the Donate link to donate any amount of BTC. Your contribution is great appreciated. Be sure to follow us on Twitter @BTCWorldNews and like us onFacebook.com/BTCWorldNews for all the latest Bitcoin News, Information and Trends.